Downtown Manchester is the economic, cultural, and historic center of the City. The Downtown neighborhood is bordered by North Elm, Union, and Willow Streets to the east, Hayward Street to the south, and the Merrimack River to the west. Manchester is the sole city in North America to sit squarely and exactly on the 43rd degree of latitude, which runs between Harrison and Brook Streets in this neighborhood. Ezekiel A. Straw, who served as New Hampshire Governor from 1872 to 1874, planned the early layout of Downtown Manchester. Straw’s vision included the public parks, wide/straight streets, and careful site planning for schools, churches, and public buildings. The influence of nature can be found throughout the City. It was originally suggested that Elm Street be named Broadway, as the street is one hundred feet wide. This main thoroughfare ultimately took its name from the Elm tree that stood on the corner of Elm and Spring Streets. Significant dates in Downtown Manchester’s history include 1835, when City Hall was built at the cost of $35,000, and 1846, when Hiram Brown was elected the City’s first Mayor. Manchester was incorporated as a City in the following month. On March 1, 1860, Abraham Lincoln visited New Hampshire as part of his presidential campaign, speaking to a group on Elm Street. The Manchester Public Library displays Lincoln’s signature from this visit to the City Hotel. Following World War I, Concord Common was renamed Victory Park. The neighborhood also includes a section that was once known as “Barbary Coast” (bounded by Lowell, Bridge, Elm and Chestnut Streets) because at the time, it was considered a “tougher” part of town. The Amoskeag Falls, Merrimack River, and the mills that arose around them have been instrumental in shaping Manchester. A canal and lock system built by Samuel Blodget around the falls in 1807 opened up the area to commerce. Originally called Derryfield, the City’s name was changed to Manchester in 1810 after Blodget’s expressed vision that the falls and Merrimack River could be used in industry. Blodget’s hope was that this City could become “the Manchester of America,” in reference to Manchester, England. The Amoskeag Manufacturing Company was later incorporated in 1831 and the large mill buildings (many of which are still being used today) were built along the river using bricks from neighboring Hooksett. By the middle of the 19th century, Manchester was the largest textile mill in the world, with one mill containing 4000 looms. Following a period of decline in the early to mid 20th century, the mills found new life. The remaining brick buildings have been transformed into businesses, restaurants, art galleries, and educational spaces. For example, the University of New Hampshire operates its Manchester campus from the former Pandora mill building. 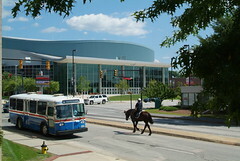 In addition to the mill buildings and Elm Street businesses, Downtown is also home to the Southern New Hampshire University Arena, an indoor sports and entertainment venue that opened in November 2001. The Manchester Cultural District Coalition formed in March 2015 as a group of nonprofit community organizations, churches, and downtown businesses that began meeting to discuss ways to spur economic development through art and design initiatives within a six-block area. Coalition members meet monthly to discuss, identify, and recommend specific actions to be undertaken. Located behind the Brookside Congregational Church (2013 Elm Street) Easy garden access from Chestnut St between Appleton and Clark Streets For more information, please call the Brookside Congregational Church at 669-2807. Volunteers can help with food production. Central Fire Station/Safe StationDial 911 for an emergency.